There are many things in life that are out of our hands. 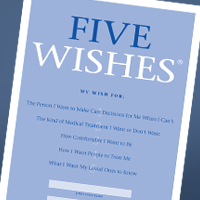 The Five Wishes document gives you a way to control something very important—how you are treated if you get seriously ill. It is an easy to complete form that lets you say exactly what you want. It was written with the help of The American Bar Association’s Commission on Law and Aging and once it is filled out and properly signed it is valid under the laws of most states.